The sun has just risen and Torben is already up, proclaiming loudly on the beauty of the intense colours in the sky. I fight my way out of the sleeping bag, automatically grasping my painting gear while gasping at the temperature – even with the stove firing away the hut is cold. The window is in the perfect position to view the sun casting warm fingers across the icy wastes, and turning ice hummocks to gold. A few pencil strokes shiver their way across the sketchbook and then I apply the watercolour washes, starting with the blaze of light that is burning away at the edge of the vertical crag. This is chiefly quinacridone gold, blending into some less violent Naples yellow, then pushing outwards, away from the point of maximum brightness with a mixture of cobalt blue and cadmium red. In the hunters’ hut this is luxury sketching for a change, especially when Jens puts a mug of steaming tea into my hand. Later on I sketch Isak tending to his sledge-dogs in his usual kindly manner, and so in the finished painting here you can see how I have brought the two separate sketches together to form a narrative. The secret of making sunlight ‘burn’ into a feature is to keep the critical edges soft and push the light area into the feature as though it has burnt a hole in the side. In the foreground I have covered the wet blue washes with cling-film and moved it about until I am satisfied, then left it to dry. It is a remarkably effective way of suggesting ice and sastrugi ridges. Beneath the sunburst I included some of the warm gold to suggest the reflections of the colour in the ice. The painting was carried out on Saunders Waterford 300lb not paper. 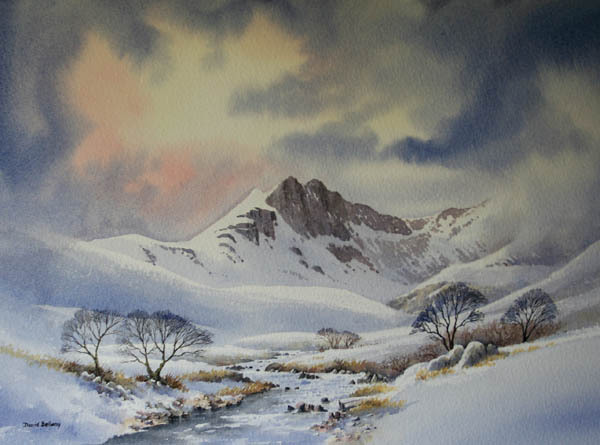 This is one of a great many paintings in my new book, David Bellamy’s Arctic Light, which has just been published by Search Press. It is crammed with paintings, sketches and anecdotes, and contains one chapter describing some of the methods used to sketch and paint, often in almost impossible conditions. Subjects vary from glaciers, sea ice, mountains, wild seas, waterfalls, people and many wildlife works are included, from polar bears, walrus, musk ox, Arctic foxes to birds. More details can be seen on my website. Winter is a time when most artists feel they should stay indoors, yet in many ways the winter landscape is more colourful, more varied and not covered in overwhelming greenery that also has the habit of hiding many fascinating subjects. Yet there are many days when getting out to sketch, or even just to photograph the landscape is not only rewarding, but pleasurable as well. You just have to choose your days, but to really make the most of it I have produced a package that should really help those who want to make the most of this fascinating season. Winter Landscapes in Watercolour is my brand-new 80-page book published this month by Search Press, and I have produced a companion DVD with the same title, filmed by APV Films to accompany it. The combination of book and film really does give you an all-round idea of how to produce a watercolour landscape and the thought processes behind it. The image on the right, for example, appears in both book and film, with the film showing me working on location, then in the studio. 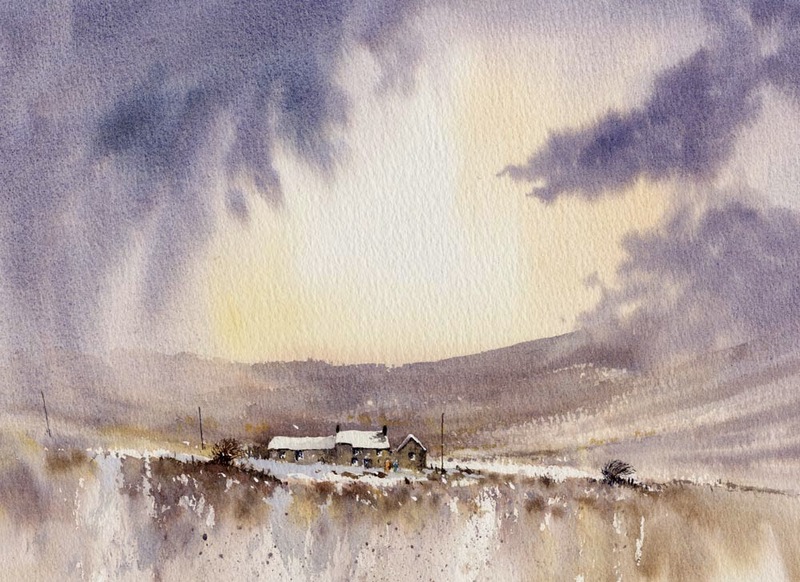 It’s a farm on the Staffordshire moorlands, a simple subject which I have made even simpler by bringing in mist at the two extreme ends of the ridge and reducing the mass of white snow patches that were present. Sweeps with a large mop brush have created a drybrush sparkle over a lighter, earlier wash that had dried, and this is especially noticeable to the right of the buildings. It’s an effective technique for suggesting rough ground without actually having to paint in a lot of detail. In the dark areas on and in front of the buildings I have left flecks of white gouache. This is clearer in the book and DVD, and really livens up the focal point. It’s important to be well-prepared for working outdoors in winter, and this is covered in the book, together with ways of working quickly. But it’s not all about working outside. The book and DVD are crammed with advice on painting the seasons from late autumn to early spring, and even if you don’t intend going outside you will find much to help your landscape painting here. At the moment we have a special offer if you buy both book and DVD from my website at http://www.davidbellamy.co.uk/davids-page/ I really enjoyed working on these two projects as for me winter is a marvellous time to be out sketching, so I hope you will make the most of this fascinating season with these useful companions during long winter evenings. I love opening the fantastic world of art and nature to students, and it’s sad we’re unlikely to see these youngsters again, for it would be lovely to see the enthusiastic ones progress their painting further. I don’t do workshops for many reasons, preferring to run occasional courses where I can take folk out into the countryside and show them how exciting it can be working directly from nature. Today’s tip takes us back into the mountains. So many times I have hiked across mountains through deep snow, up crags and gullies, and taken tremendous efforts to reach a scene to paint. This one, however, is in Snowdonia in North Wales where I simply got out of the car and sketched this view. In places like Snowdonia you don’t always need to trek across mountain ranges to get that stunning subject! In the watercolour you will see how I’ve created the shadows with fairly strong ultramarine, while leaving the white of the paper to depict the snow highlights. A snow scene can look extremely cold and forbidding, though, unless you introduce some warmer colours. One of the obvious places to do this is in the sky, where I’ve laid Naples yellow and some alizarin crimson to warm it up. Had I pushed this further across to the right I could have also included some of these colours as reflections in the stream, but I was happy with the way things were. Beside the stream I’ve added bunches and strings of reeds with the warm yellow ochre, a useful colour to drop into the foreground of a snow scene to relieve the overwhelming cool – there’s that word again. I’d better shut up!